The Medium House Shot Monster gets Stronger! 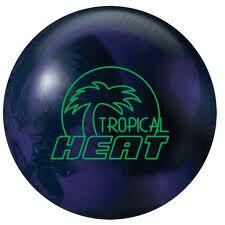 Our latest review is of the Storm Tropical Heat Hybrid Black/Purple. As usual, keep in mind that the coverstock will account for 70% of ball reaction while the core characteristics and drilling will dictate the shape of the reaction. The ball is drilled with 4 5/8″ x 6″ x 3 1/2 ” using the pin buffer system. For those unfamiliar with that, the angles are 80×4 5/8 x55. Generally speaking, this will delay the roll and have a medium transition at the breakpoint with good flare. 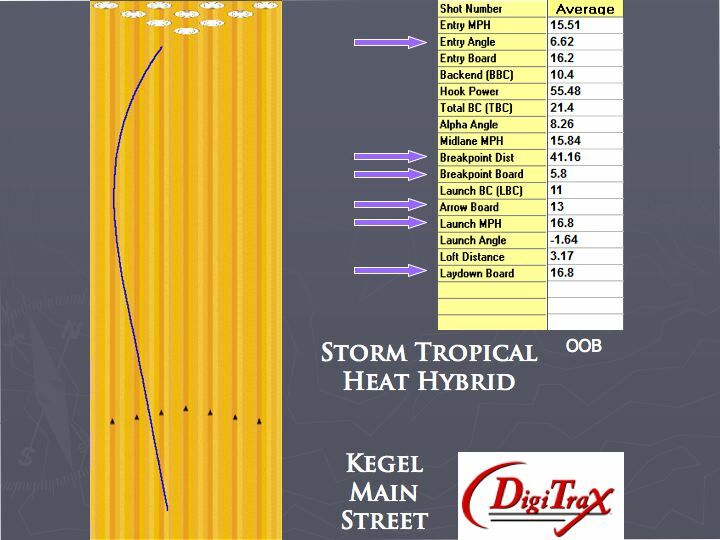 The ball was tested on the Kegel Main Street representing a Typical House Shot (THS) and the 2012 USBC Championship Open pattern. Main Street is a 41 foot tapered pattern. 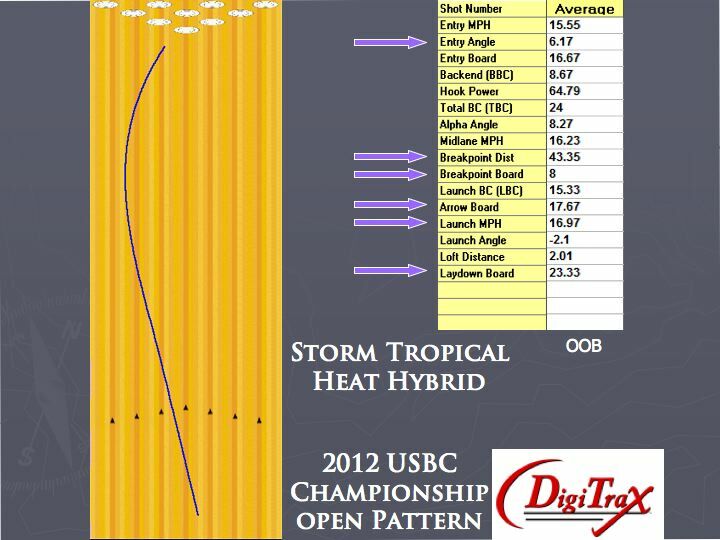 The USBC is a sport compliant 39 foot shot with a 2:1 ratio. This is still the ball that I’ve grown to love. Very good benchmark ball for medium house shots. This core and cover which both have been in higher end balls are now in the lower Tropical Line. Really good bang for the buck here. We’ve seen the Turbine core before. With an RG of 2.55 and Differential of .038 for a 15 pound ball, this core allows good length with a strong move on the backend. The differential doesn’t seem all that high, but the ball definitely can make a move on the backend. It makes for a very predictable motion on lane. I should just have a standard comment for these Storm covers. The Reactor line of covers are simply stellar. The Tropical Heat Hybrid uses the original solid Reactor. It works very well and can be easily adjusted to whatever finish you like. The out of box finish is 4000 grit abralon to give this ball a bit more teeth for a low end ball. Truth be told, I still have a Storm Furious as my house shot benchmark ball. It works best for medium or medium/light house shots in a very light polished finish. The Tropical Heat Hybrid Black/Purple comes in a grittier 4000 finish. I mention the Furious as that was one of the earlier balls which used the Turbine core so I am extremely familiar with this ball reaction. I even drilled it identically since I had excellent results. Well, I saw just what I expected. The original Furious came in 2000 grit abralon. In the medium/light conditions I was seeing, 2000 was simply too aggressive. Taking it to 4000 with light polish worked wonders. Now the Tropical Heat has a hybrid cover, but in 4000 abralon instead of the typical 1500 grit polished finish Storm usually puts on their Hybrid covers. Basically, you get reasonable length with a consistent rounded backend reaction. What I liked about this core is the following shape: easy length, rounded breakpoint, and heavy roll and continuation. The core seems to create to match perfectly to the typical 39-41 foot length patterns in terms of when it makes it’s move. 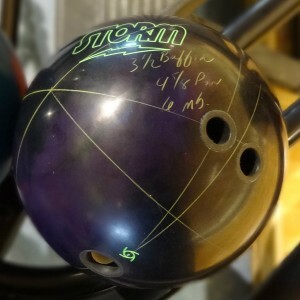 This means an explosive hit at the pins, especially considering the price point. With 4000, the Hybrid actually plays more like 2000, especially when it’s brand new out of the box. However, it settles quickly once it gets a little lane oil on the surface. With the reaction I described above, you see something slightly different with an aggressive coverstock finish. The length will come down by 1 to 1.5 feet making the rest of the reaction a bit “rounder” and smoother, but not by much. This out of box finish makes this ball fit the Medium and even medium/heavy conditions. It can create good traction and gives balls more expensive a run for their money, to be sure. I find the ball to be more effective on medium to medium/light conditions so prefer to go with slightly less surface. I’m not talking a big change, but just a light coat to add the foot or so of length. The ball works well on the medium to medium/heavy, but it works really well with slightly lighter conditions. Its overall dynamics seem more conducive for those patterns as the ball destroys the rack on those conditions. This is the second Tropical Heat Hybrid, with the first one coming with a 1500 grit polished surface. You can create that surface with this ball as well, of course. If it’s not obvious, this ball is simply a phenomenal benchmark ball. If you adjust the surface to the conditions you are facing, you will find a very punchy ball with a very predictable, yet strong overall motion. This ball seems to transition at the right time for those 40 or so foot patterns and just really drives through the pocket. It’s a very inexpensive way to get a ball that can work on a ton of conditions. One thing to keep in mind is your rev rate. Since you’ve switched to lefty just recently, my guess is that your rev rate is on the lower side. The rev rate in the video is over 350. For me, this ball is pretty punchy on the backends. However, if you’re rev rate is lower, you will not get the same pop. You can watch John G since he has a Hybrid as well and he is a stroker. The new hybrid will be similar to the solid as it seems to have a bit more solid than pearl in the cover. However, Storm still does make the Hybrid that comes 1500-grit polished from the factory which is likely to add some pop for you. Of course you can pick up either one and adjust the surface to your liking. I just think the Black/Purple version plays a bit more like the solid than the pearl.